Blog Haven’t you heard ladies? Beauty starts at 50! Haven’t you heard ladies? Beauty starts at 50! I can not emphasise enough that what you put into your body affects your looks, energy level and the way you feel about yourself, especially after we hit the big 5-0. Beauty truly does start from within, and no creams or quick fixes will give you the radiance you desire unless you feed your body with the nutrition it needs. Simple life changes can make all the difference. Drink plenty of water to hydrate and plump up your skin, eat well, exercise and get enough sleep. Understand that what you are eating will not only effect your skin, but your weight, mood and energy levels too. Once you’ve focused on what you are putting on the inside, you can then focus on what you put on the outside. Re-think your makeup after 50! Between our 40s and 50s our skin changes in texture and colouring, with more wrinkles seemingly appearing overnight. Our trusty make-up routine that we may have stuck to since our teens is no longer cutting it and can even be making us look older. After 50 you may find that your skin has become more dry, leaving your trusty foundation siting in lines and skin cracks and creating an uneven and ‘cakey’ coverage. Keeping your skin moisturised will create a good base for you to work with. Why not consider switching to a BB cream or tinted moisturiser. They continue to give your skin coverage throughout the day, but all also that much needed moisture. Look for ones that also contain anti-ageing ingredients and an SPF of 30 or above. If you really feel that it’s not giving you the amount of coverage you need you can use a cover-up stick on problem areas such brown spots or skin pigmentation. You may notice that as you get older, your lips seem thinner. Lip Fillers can plump out your lips to bring them back to their former glory, but if that’s not something you’re ready for you can make them appear plumper with a good lip gloss, nothing works better, in fact. Add a little colour first by filling in lips with a lip liner or lipstick a shade or 2 darker than your natural lip colour, then add a dab of gloss on top and voila! Instant lip plumper. Although you can still use lipstick, stay away from dark lipsticks which age just about everyone. Lip pigment can also fade with age, so if you want to consider something less high maintenance then Semi-permanent tattoo make-up can blush in colour onto the lips making them appear fuller and more youthful and lasts around 12-24 months. As we age, one of the areas that can show it the most is our eye area. In particular, our sagging eyelids which can almost obscure any eye make-up we put on them. There are changes you can make to improve your eye area and if you subtly make your eyes the centre of attention on your face they will draw away from other areas. Stay away from dark eye shadows. Instead contour with a light colour on your lids, a medium taupe in the crease and a dark liner between your upper lashes and not above. If you’re fed up with the daily battle of eyelid excess skin, you could consider Eyelid Surgery that removes the excess skin in that area making your eyes look more youthful and awake, restoring them to their former glory. Stay in the now and focus your beauty in the moment and never compare it to the way you used to look. Skin tone can fade as we get older, so you will need to add the colour back in after you’ve covered it in a blank canvas with your chosen foundation. Warm your skin up by gently brushing bronzer over the areas the sun would naturally hit, adding warmth and not defined colour. Always use blusher on the apples of your cheeks, following up your cheek bones, but remember to use it sparingly as you don’t want to look like a clown. Stick to blushers and bronzers that are matte in texture. Your skin will need extra TLC in your 50s. It may have not only have been affected by the natural ageing process, but also by hormones. You may find that your skin type has changed from oily to dry or vice versa. It is worth visiting a skin care specialist for analysis and advice on how to care for your skin going forward. Regular Chemical Peels can remove surface dead skin cells and help reduce the appearance of fine lines, and skincare with active ingredients such as Hyaluronic acid, Vitamin C and night creams which contain Retinol are a good starting point. If you are now feeling that the changes you’re seeing in the mirror do not reflect how you feel on the inside and no amount of skin creams and make-up are going to help you to feel comfortable in your own skin, then maybe it’s time to consider the help of cosmetic surgery to turn back the hands of time. Although cosmetic surgery is a personal choice to address which areas you would like addressed, we would recommend these three cosmetic treatments for natural age reversal results. Taking his place in history for advancing facelift techniques, Bella Vou’s Lead Surgeon, Amir Nakhdjevani, developed the revolutionary Concept™ Facelift. 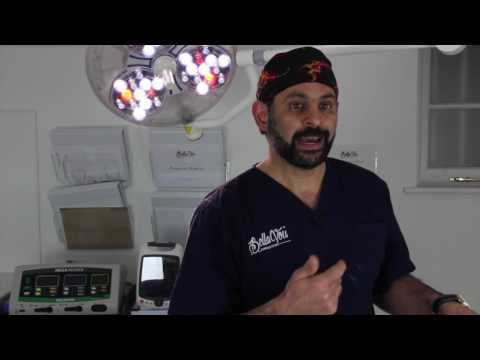 The revolutionary new procedure can be performed under a local anaesthetic, dramatically reducing risks involved in undergoing a general anaesthetic and subsequently reducing bruising and downtime recovery. 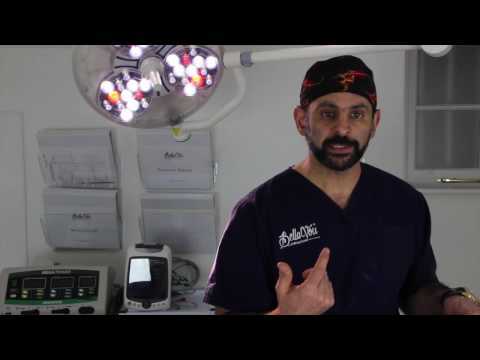 Watch to see Amir explain the Concept™ Facelift procedure. Extra skin and fat on the upper eyelid can cause the eyes to feel and look tired. Taken to the extreme, the extra skin can hang so much that it can hamper your vision and cause discomfort. Eyelid surgery combined with Eyebag Removal can effectively reduce the excess skin from the upper and lower eyelids to leave you with wider more youthful looking eyes and you will be free to wear your make-up how you want. Neck rejuvenation or neck lift surgery is one of the most popular cosmetic surgery procedures. For those who have excess fat under the chin but still have good muscle tone and skin, liposuction of the neck will be sufficient. If the skin has lost elasticity, removal of excess skin (Neck Lift Surgery) to tighten and tone the neck will also be required. Tightening of the platysma muscle (also known as platysmaplasty) will require a small incision under the chin away from direct view to gain access to the front edge of the muscles on the neck; they are sutured together with permanent stitches. The muscles of the neck are the foundations and building blocks of the neck and are fundamental to achieving a tight and toned result. It is often recommended that a facelift and neck lift procedure be performed at the same time.